The SuperChrono is a simple to use portable shooting chronograph. Provided that the bullet travels at supersonic speed you get reliable velocity readings in all light and weather conditions. Supersonic speed means the bullet travelling faster than approx. 343 metres per second. When a bullet travels at supersonic speed it generates a shockwave which passes over SuperChrono’s two acoustic sensors. Its speed is calculated from the time it takes the shockwave to hit the first and then the second sensor. At its largest the detection area is 80 cm wide and 130 cm high. Precision is the same throughout the entire detection area. The illustration shows the shape of the detection area. Ensure that you are shooting towards a safe backstop. Make sure that the weapon is not loaded and remove the bolt before you start setting up the chronograph. Always consider safety first. The chronograph uses four AA batteries. Turn the chronograph upside down and use the Allen key supplied to open the battery cover. Insert the batteries. Positive and negative are indicated on the base of the battery compartment. Screw on the battery cover and set up the chronograph on a photography tripod with a ball head. Turn on the chronograph. In order to obtain correct velocity readings you must use the sights to line up the line between the sensors and the line from the muzzle to the point of impact on the target. The set-up will then be parallel. The procedure appears below. 1. Position the chronograph at least three metres in front of the muzzle. For magnum and high-speed loads you have to place it 5m (17′) in front. 3. Find the height from the chronograph up to the line between the muzzle and the point of impact on the target, for example 30 cm. Using the sights, aim the chronograph 30 cm below the point of impact. 4. Aim the chronograph directly below rather than to the side of the point of impact. 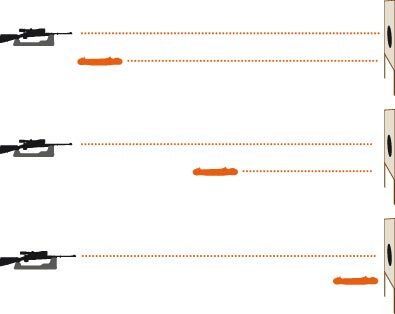 Following these four points will give you a parallel set-up with a consistent height between the line from the muzzle to the point of impact and down to the axis through SuperChrono. You can place the SuperChrono between anywhere from 3-5m /10-17 feet in front of your shooting position and the target. Just make sure the set-up is parallel as illustrated below. 5. Fire every shot from the same position and always shoot at the same point on the target. This will ensure that you can be certain that you are maintaining a parallel set-up. – If the setup is not parallel, the bullet will travel on a path longer or shorter than that between the two sensors and the reading will not be correct. This applies to any two-sensor setup, whether it is acoustic, optical, electromagnetic or radar. Do I always have to place the chronograph one foot below the bullet path? – No, you can place it at any level from immediately below the path of the bullet to 1.3m (51inches) below the path of the bullet. See illustration top right for detection area. The detection area may be smaller than shown if you are shooting light loads or when there is rain or snow. The display is angled 15 degrees towards the shooter. If you wish to monitor individual shots from the shooting position, place the device 1m below the path of the bullet. Do I always have to place the chronograph directly below the path of the bullet? – No, you can place it up to 15 inches or 40 cm to the side of the path of the bullet. See illustration top right for detection area. If you place the unit 15 inches to the right, aim it the same distance to the right of both the gun and the target. If the distance up to the path of the bullet is one foot, aim it one foot below the gun and the point of impact. The setup is now parallel and readings will be correct. Why place the chronograph at least 10 feet or 3 metres in front of the muzzle? – This is to avoid detecting the muzzle blast itself. The muzzle blast depends on the load. You will get correct readings from a supersonic .22 LR very close to the muzzle. For magnum and high-speed loads you may have to increase the distance to 14 or 17 feet, four to five metres. Must the chronograph always point towards the target? – The SuperChrono detects shots either way, so you can position it whichever way you find it easier to aim. What happens if I position the chronograph very close to the muzzle? What happens if I aim the chronograph above the parallel line? – The velocity reading will be too high. What happens if I aim the chronograph below the parallel line? – The velocity reading will be too low. How critical is aiming error? Are the readings affected by temperature and variations in the speed of sound? – My SuperChrono comes with a spirit level. What’s it used for? -It’s there to give you a general idea about where to aim. For accurate readings you have to use the sights. • Do not place the chronograph straight on the ground or on a wooden board. This produces false readings because the shockwave is reflected from the surface. Use a tripod instead. • Replace the batteries if the display begins to flash.